Bovina artist Corneel Verlaan has spend fourteen years flying the skies of Delaware County in a Cessna 172 with a camera trained at the ground through the plane's open window. Tomorrow, he will show the flightless what our towns look like from the sky. His exhibit of aerial photographs, called "Delaware County, Air & Space," is opening at the William B. Ogden library in Walton at 2pm. In anticipation of his opening, Verlaan has shared some of his photographs with the Watershed Post. 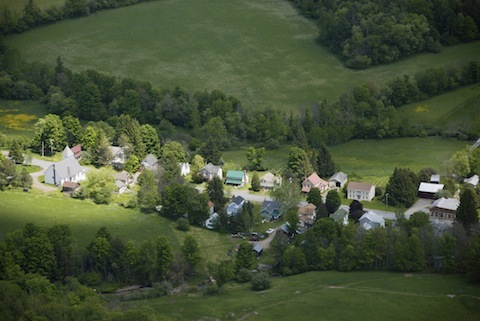 (Above is the town of Roxbury, as seen from the air. Below are Delhi and New Kingston.) Verlaan also answered some questions over email about what led him from the Netherlands to an airplane above rural upstate New York. DelhiWatershed Post: How did you get the idea to photograph local towns from above? Corneel Verlan: I have been flying over this area since '96. Mostly as a way to experience immense space, ultimate 3-dimensional, reducing whole areas to 2 dimensions, as a metaphor for creating space on a flat surface. The landscape, mountains, endless forest and shapes of man-made meadows was a help in 'reorganizing' space. I started to recognize characteristics of individual towns, and how, though close together from above, they had developed totally differently, depending on the dominant economic activity (farming, stone quarries, lumber, water mills). On the ground I noticed how far away neighboring towns actually are, and that towns on the east side of the county are not very aware of what' s going on on the west side--which are very different type towns, but part of the same government and economic structure. The county is in a transitional period, and it would be useful to have an overview, as a visual snapshot in history. WP: What has this project made you notice about Delaware County towns that you can't see from the ground? CV: That there is a great deal of economic activity in a much more diversified way than visible on the ground. That the peeling paint and closed main street stores don't show up from 1500 feet, and that most towns look very self-sufficient, like the farms that sprouted them. I began to see the land as a living organism, in which the towns are nerve centers, the rivers that connect them a life force, and the roads and byways a very intricate nervous system. And much more. New KingstonWP: Tell me a little about your career as an artist -- what other work have you done? CV: I went to art school in The Hague and Haarlem, in The Netherlands, as a painter and printmaker. I was moderately successful in NL, but had great curiosity about the rest of the world. I went to graduate school in Indiana, for what was to be for a short period, but I decided after a couple of days that the US was home. Not because it was so comfortable, but because life here is quite challenging, making you dig deeper in your arsenal and develop in unpredictable ways. I moved to NYC, and things began to move well around my painting, but economic necessities caused my wife Trish and I to start an art shipping company, Seifert Verlaan Inc, in 1979, which specialized in traveling exhibitions for museums, in all media. The company was successful, and does, in fact, still function, albeit on a smaller scale. It did keep me from concentrating on my work as a painter, though, so gradually I have returned to my chosen profession. I've had several one man shows in Europe and in the US, and am associated with the Longyear Gallery in Margaretville. I did also teach college, mostly drawing. Photography has been something I've done all my life, though not as intuitively as drawing -- it's another way to gather visual information. WP: Where do you live in Delaware County? CV: We live in Bovina, NY. We bought the place in 1985, as a counterweight to our life in NYC, The original appeal was that the landscape looked like the etchings of a 17th-century Dutch painter, which were imaginary mountain valleys that suddenly appeared real. Our daughters grew up here, had an excellent start to life, and still consider Bovina home. WP: You're Dutch -- how did you end up in upstate New York? CV: There is a certain affinity between upstate New York, which was settled by the Dutch 1609-1666 (Albany used to be called Beverwyck), as there is between Amsterdam and NYC (Nieuw Amsterdam). The proximity of NYC helped us keep the company alive, while living closer to the elements, nature, gardens and other people living a version of a pioneer existence. At the same time: Nothing is more different. There is vast space here, many intriguing points of view, a rich history, great opportunities. Holland is all about water, mostly about keeping it at bay, but also to use it in the best way possible. The Catskills produce and store water, utilize it in different ways, but it's still close to my native interests.